The TR Series Timing Relays are designed to meet most timing requirements by offering more flexibility in range of input voltage, timing range and functionality. 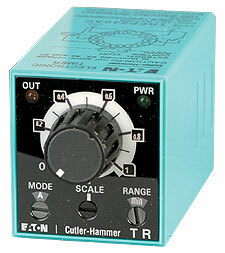 Use a rotary switch to choose from 20 selectable time ranges from 0.1 second to 600 hours. We offer both a power triggered and signal triggered model—each with expanded operation modes. There is a green LED to indicate when power is ON and an orange LED when output is ON. 참고: Comes with installation guide.